Credit: Kristiina Tambets et al. Thus, Mari and Udmurts were closer to the Khanty and Mansi, living on the other side of the Urals, than to the neighboring Tatars, Bashkirs, Chuvash. At the same time, Finns and Sámi showed greater commonality with the Volga Mari, Komi and Udmurts, and even with West Siberian Khanty and Mansi, than with geographically close Swedes, Latvians, Lithuanians and northern Russians. However, there are exceptions such as Hungarians and Mordovian peoples. Since the researchers wanted to see if there were any correlations between linguistic, geographic, and genetic data for Ural-speaking populations, they took lexical distances between languages ?? (calculated by linguists proportion of common words in a special list of stable vocabulary), geographical distances between populations and, finally, genetic distances between populations, which serve as a measure of genetic similarity. It turned out that all these data types have a positive correlation, which indicates their interdependence. The common genetic component found in the Ural-speaking populations indicates that they share common history. Apparently, the spread of the Uralic languages ? ?was associated with the spread of genes or with migrations. 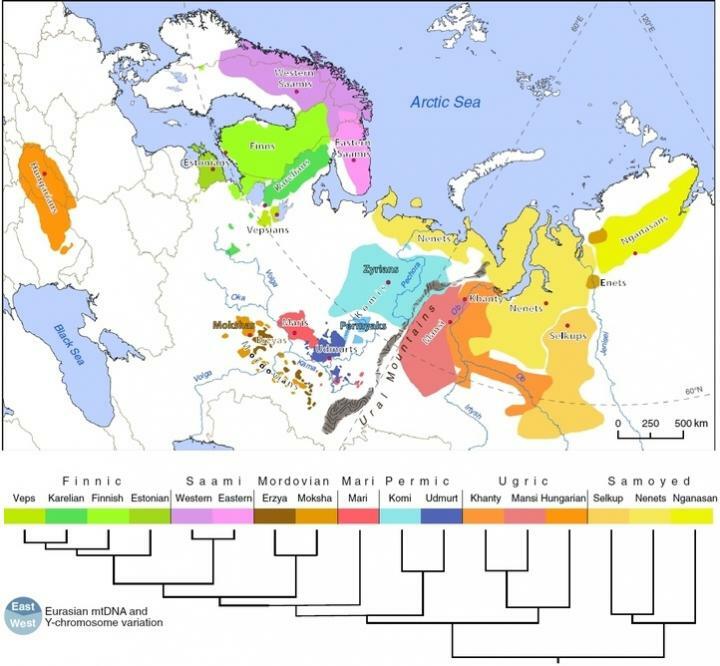 Scientists consider the center where the migrating groups originated to be placed in Western Siberia. Thus, in their opinion, the peoples of the Ural linguistic family are linked by genetic roots of Western Siberian origin. "This is the third joint article by Estonian Biocenter and Russian scientists," commented Dr. Oleg Balanovsky, the head of Genomic Geography Laboratory of the Institute of General Genetics. "The first was devoted to the Turkic-speaking peoples, the second to the Balto-Slavic peoples, and the third to the Ural-speaking ones. In all cases, it was shown that the geographic factor plays the main role in the formation of the gene pool, and linguistic kinship fades into the background. At the same time, the analysis of the Turks and the Ural-speaking populations revealed a common component in their gene pool. This small but real share can be connected with the people through whom these languages ? ?were spread initially."